GMAT, the Graduate Management Admission Test exam is used by more than 7,000 programs at approximately 2,300 graduate business schools around the world. The GMAT exam — the only standardized test designed expressly for graduate business and management programs worldwide is available through out the year at over 600 test centers in more than 110 countries. Aspirants of GMAT can visit GMAT EXAM CENTERS to identify the nearest GMAT exam centers and to determine the availability of the GMAT exam centers for the desired exam date. 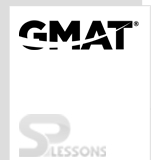 The GMAT Exam Is Available Worldwide. CLICK HERE – TO FIND A GMAT TEST CENTER.